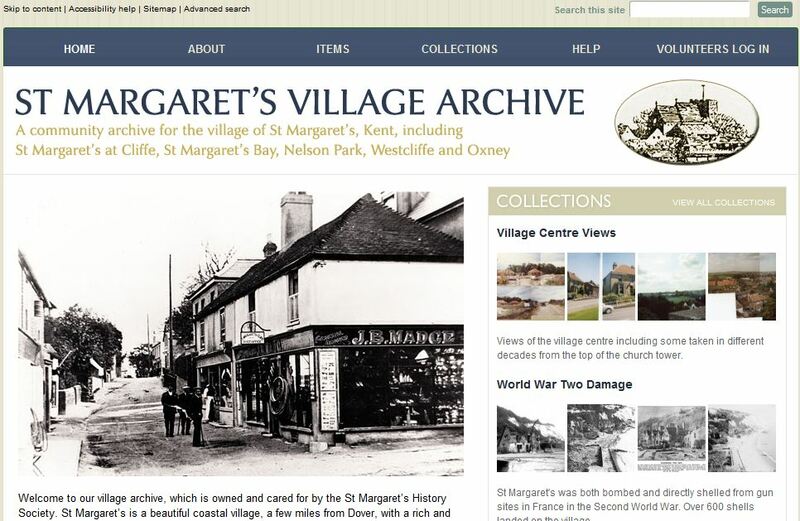 The St Margaret’s Village Archive is a wonderful collection of over 12,000 items of village history which has been put together largely by the Hon. Archivist of the St Margaret’s History Society over the last 40 years. St Margaret’s has a very rich history. Its location on the cliffs next to Dover made it a rather select fashionable Edwardian resort, and it has had many famous residents including Henry Royce, Noel Coward, Ian Fleming, Peter Ustinov and Miriam Margoyles. The archive also contains much on the farming history of the village, its historic buildings, its people and its unusual Second World war history when it housed cross channel gun sites and hundreds of servicemen. Other material include files about the archaeology of the village (impressive Bronze age and Saxon discoveries) its many schools, pubs, shops, shipwrecks, lighthouses, undersea telegraph cables to the Continent, smuggling and coastguard history and its French convent. In 2011 a project was set up to make the archive, which was until then stored in a private house, much more accessible. Since then over 15 volunteers, led by a former professional Museum Curator, have manually catalogued over 7000 items and scanned over 5000 images, which are added to monthly. A home has been found for the archive in the village hall. Funds to support this work were raised from the Parish Council, the Bay Trust and several local village organisations. The online catalogue serves not only as a resource for the general public but as the group’s own electronic catalogue, with some items such as those with copyright or data protection issues are only available to password holders. The archive group has revitalized the St Margaret’s History Society, which owns the archive. Membership of the Society has grown from about 50 members to 150 as material from the archive is used in the society’s talks programme. Some of the Archive volunteers give talks for the Society using material they have researched. We also have an annual exhibition. In 2013/4 we obtained a grant from HLF to carry out an oral history project in the village and recorded over 30 interviews with villagers and published a book about the connections between the village and the Rolls- Royce founders ( Henry Royce designed the first R-R aero engine here in 1914. One of our volunteers has just completed a photographic survey of every gravestone in the village’s two churches which will be put on our website. We have also started a house history project, looking at the history of houses in the village and the people who lived in them. We contribute to many village events with information and displays and often work with our local Primary School.